I love Google Cardboard, and I think that it’s one of the biggest reasons that 360/VR has become popular. Meanwhile, there’s the other mobile VR platform, Samsung Gear VR. I thought it was just an overpriced alternative to the Google Cardboard until I tried it out and discovered how wrong I was — it’s on a whole other level of VR. I use an iPhone, so I had very little interest in the Samsung Gear VR. But one day, I tried the Oculus Rift and the Gear VR and I was very impressed with both of them. But it wasn’t enough to get me to buy the Gear VR. Meanwhile, I got the Gear 360 camera for its video quality and its price. And unfortunately for me, I could process the videos but not the photos with my laptop. So, if I wanted photos from the Gear 360, I could either buy a newer computer or get a used Samsung Galaxy S6. So I got the S6 (yes I was able to process the Gear 360 photos with it). Since I already had the S6, I decided to get the Gear VR. Having tried it again, I would say the Gear VR is definitely a keeper. WHAT’S THE DIFFERENCE BETWEEN SAMSUNG GEAR VR AND GOOGLE CARDBOARD? 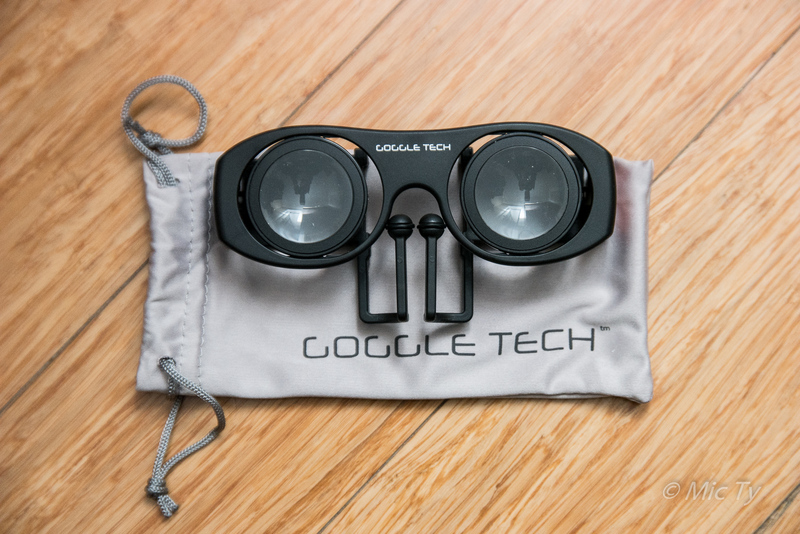 If you’re reading this, I assume you’re already familiar with Google Cardboard. You insert your phone in a headset (sometimes literally made of cardboard), and view 360 photos, videos, and games. As you look around, you can see above you, behind you, or below you. It’s pretty incredible. Samsung Gear VR also uses a phone in a headset, and the concept is similar to Google Cardboard – it’s a way to enjoy 360-degree content. The difference is the distinction between an active and passive VR headset. Some of them have a magnetic button that can act as a trigger for some games, and some have built-in headphones to plug into your phone’s jack. But all the hard work is done by your phone’s gyroscope and accelerometer. Some even look a lot like the Samsung Gear VR. 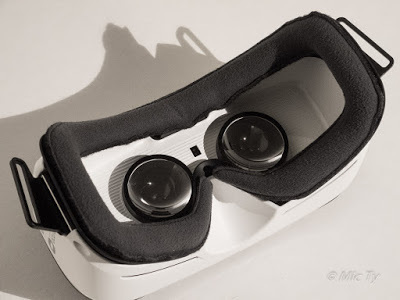 It’s easy to imagine the Gear VR is just like Cardboard. But it’s not. 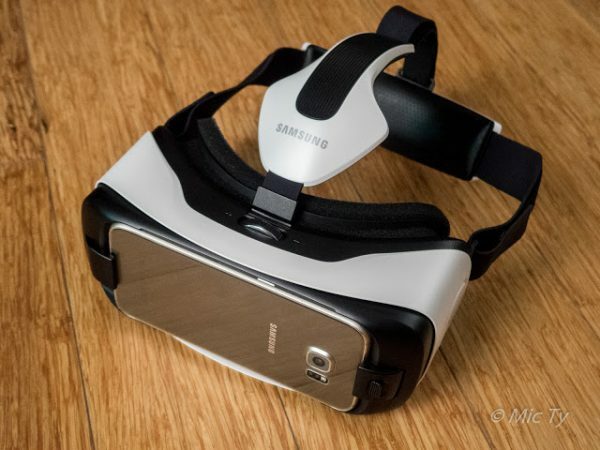 S​amsung Gear VR is an active headset. It has its own IMU (inertial measurement unit), i.e. gyroscopes and accelerometer, and other electronics to provide much more accurate head tracking. It has other tricks that I’ll mention later. But so what if the Gear VR has electronics? What’s the difference in the real world? If you have a seat and look around you, your view changes, but moving your head does not move the objects around you. Obviously, everything stays where they are, or continues on their motion, independent from the way you move your head. With Cardboard, moving your head changes your view, but the 360 sphere around you also moves slightly in response to your movements. It’s less noticeable when you’re just using a VR magic window (holding your phone out in front of you). When you’re using a Cardboard viewer, the image is magnified, so these tiny movements become more noticeable. It’s sufficient for your brain to recognize that even though the view changes as you look around, you’re only looking at a display that you happen to be wearing. That’s why there is zero sense of presence with Google Cardboard. With the Gear VR, as you look around, everything that you see “stays” in their place solidly, oblivious to your head movements. Because they appear to stay in place despite your head movements, it is sufficient to convince the unconscious parts of your brain that they exist “out there” (not in a display you’re wearing). Welcome to virtual reality. This is the biggest difference between Cardboard and Gear VR. So, all the screenshots from Gear VR are useless, even those in stereoscopic 3D. They simply cannot convey the persuasiveness of the VR illusion that the Gear VR can create. The only way to experience it is to try it out. – asynchronous time warp: “generates intermediate frames in situations when the game can’t maintain frame rate, helping to reduce judder.” Judder, btw, is when the image skips or sometimes shakes a little bit due to the inability to keep up with your head movement. – higher processing priority: when using the Gear VR, the phone will prioritize the processing for the VR calculations. So, yes the Gear VR has a lot more technology in it. This is why even though there are Google Cardboard viewers with wider field of view and are more comfortable, they simply won’t be able to do what the Gear VR does. I’ve described the difference between Gear VR and Cardboard. It sounds amazing, doesn’t it? But the Gear VR is not a full VR system. In the experiment above, note that I first said “have a seat.” That places you within the Gear VR’s limits. 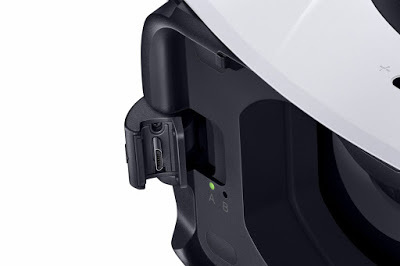 The Gear VR has head tracking / rotational tracking but not positional tracking. Head tracking means you can look around and as long as you stay where you are, the VR illusion will be maintained – you’ll be able to see above you, behind you, or beside you. But if you lean more than a few inches forward or in any direction, the system won’t be able to adjust the image to match your movement. In a true VR system, there’s positional tracking, which means that not only will your view change as you look around, but it will also change as you move in any direction. If there’s something in front of you, and you move sideways far enough, you’ll be able to see behind it. 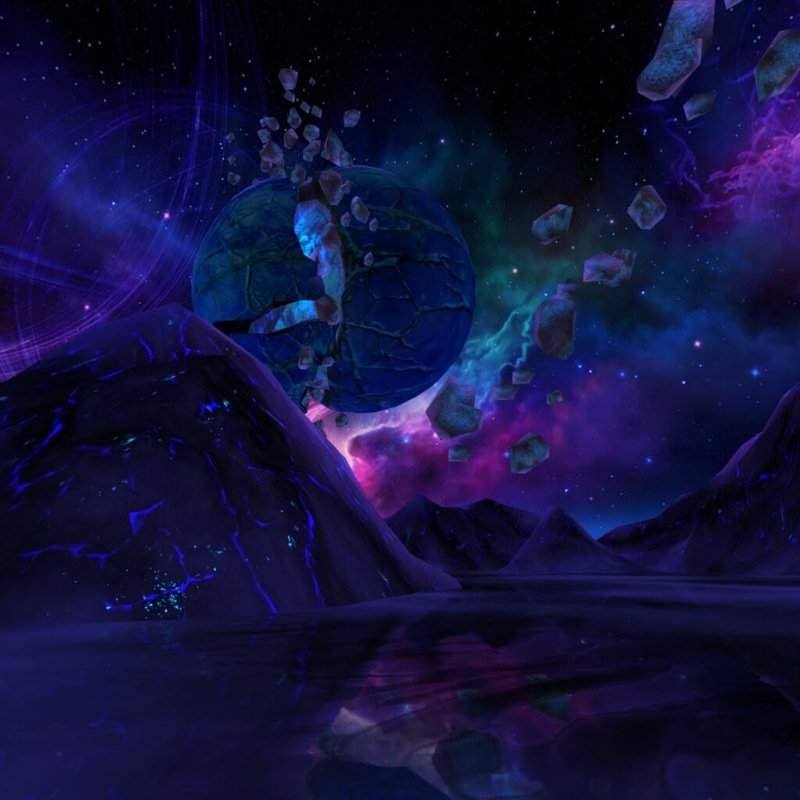 On the Gear VR you will feel like the image surrounds you (kind of like Professor X’s Cerebrus). This is immersion. Because Gear VR does not have positional tracking, it has only a very weak sense of presence, the illusion of feeling like you’re somewhere else (Google Cardboard has no sense of presence at all). On a true VR system, it really did feel like I was somewhere else. What’s it like to view 360 photos and videos on the Gear VR instead of Google Cardboard? There is definitely a much stronger sense of immersion. 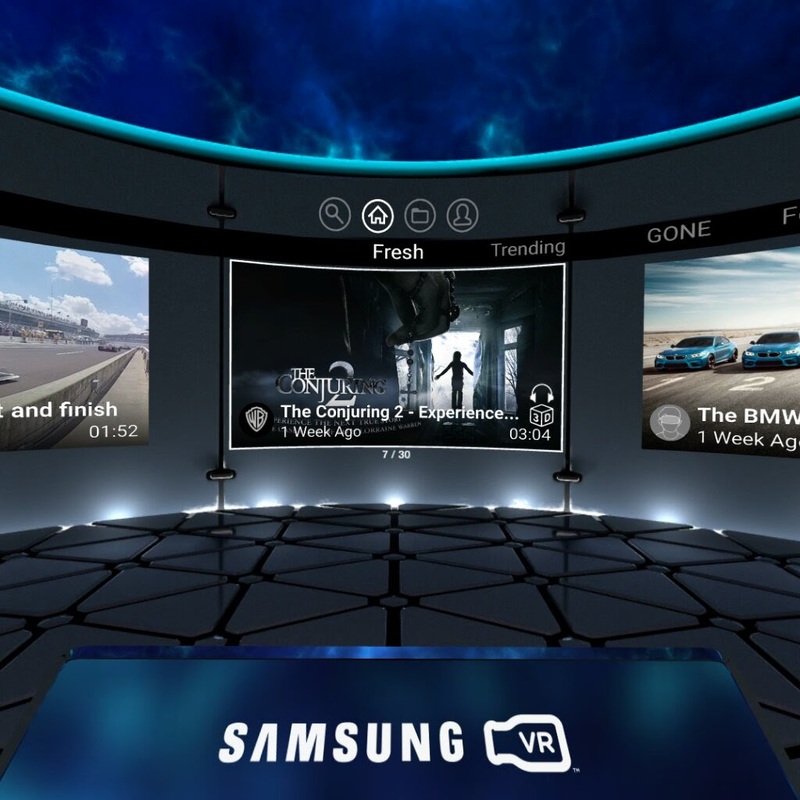 When I view my 360 images with the Gear VR, I do feel completely surrounded by the image. Even though the field of view is only about 96 degrees and I can easily see the frame of the headset with my peripheral vision, there is a strong illusion that the image exists outside of me and my headset. This is true even with 2D spherical photos. With 3D spherical photos and videos, not only is there a strong sense of immersion, but I also feel stronger presence. It’s still only a tiny fraction of the presence I feel on a full VR system, but it’s noticeably stronger than with a 2D photo or video. For example, one of the 3D videos I enjoyed watching on the Gear VR was this sailing video captured with the Vuze 3D 360 camera, which is available on the Gear VR edition of Vrideo. 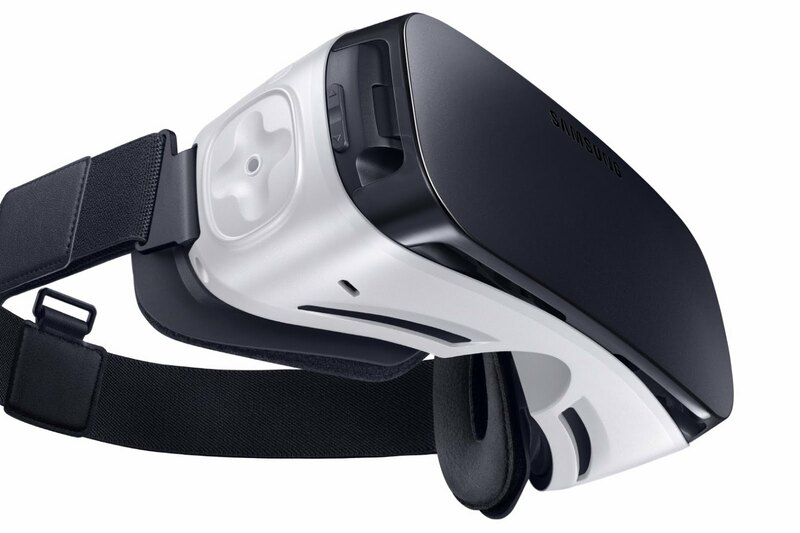 To use the Gear VR, you attach your smartphone with two hinged clips on the front of the Gear VR. To do that, first you select the right distance for the clip (position A for Note 5, position B for other smartphones). Then you attach your compatible phone to the clip on the right side, which has a built-in USB port. The first time you do this, you’ll hear a voice from your phone prompting you to remove the phone and go through the installation of the Gear VR software. After installing the software, you attach the smartphone to the right-side clip again. As you push the phone down against the left clip, the spring loaded clip clamps on to your phone, securing it to the Gear VR. Once attached, you wear the Gear VR, and the Gear VR software launches. When you use it the first time, there’s a tutorial that shows you how to use the control pad and back button. Then you see the main menu which floats in a modern spa-like hall. You then use the control pad and the cursor to navigate the menu to your desired app, or to the Oculus store. 1. Can accommodate headphones. The Gear VR has space for you to insert a headphone jack. 2. There’s also a pass-through USB port on the bottom. 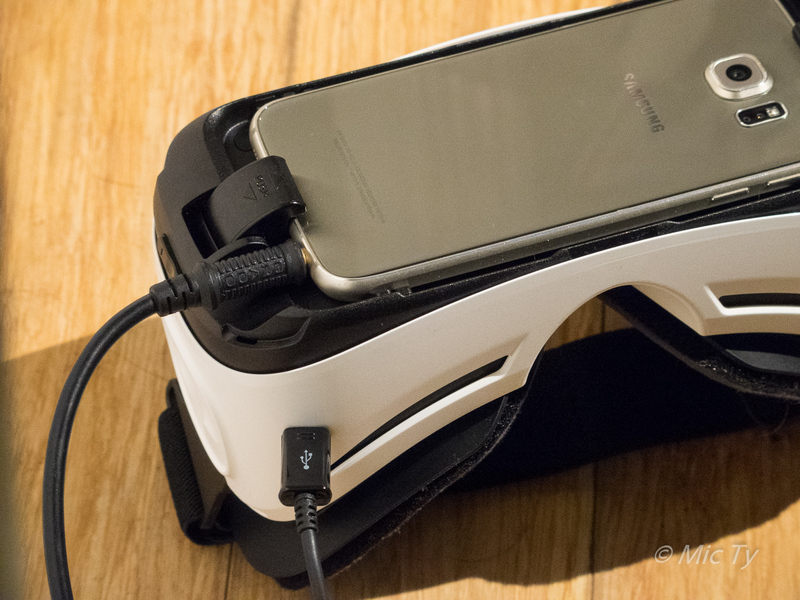 You can plug the Gear VR to an outlet to save your phone’s battery. In addition, if you’re not using the Gear VR, it will charge your phone. 3. Proximity sensor. The Gear VR has a proximity sensor so that it can detect when you’re wearing it or not. When you’re not wearing it, it pauses your content automatically and the display turns off. It’s a little too sensitive so that when I’m cleaning the lens, I hear it turning on and off. 4. Focus adjust (with indicator). There is a dial on top to adjust the focus by moving the lens array closer or farther from your eyes. Unfortunately, because the lenses are moved together, there is no individual adjustment per eye (but see modification below). There are also lines on the left side to help you remember your desired focus setting, if sharing between family members. 5. Volume control On the right side, there are buttons for adjusting the volume without you having to remove the Gear VR. 6. Control pad. On the right side of the Gear VR is a control pad that uses capacitive touch. You can press it like a button but it will detect your touch like a touchscreen. There is also a back button above the control pad. 7. See through. You’re supposed to leave the front cover off the Gear VR to avoid heat buildup. It also allows you to use the phone’s camera. On the universal menu, there’s a see through mode that will let you see with your phone’s camera so you can look around the real world briefly without having to remove the Gear VR. 8. Screen capture and screen recording. In the universal menu, you can do a screen capture or screen recording. Rather than taking a literal screenshot of the distorted display on your phone, it will capture a simulated view of what you see on the Gear VR display, at 1024×1024 resolution. 9. Removable foam pads. The foam pads are removable for cleaning or possibly replacement (though Samsung’s not selling foam pads now). 10. Anti-fog fan (on Innovator Edition). The first generation Gear VR, called the Innovator Edition, had a built-in fan to reduce fogging. If you’re looking for one app to show someone what Gear VR can do, I think this would be it. GrooVR puts you in an alien world while playing music from your library. Simple enough, but the VR illusion is spectacular. This VR app probably had the strongest sense of presence for me. Netflix: you can watch Netflix in a virtual home theater. You’re in a nice mountain lodge on a couch watching what looks like a 100-inch screen. Samsung Internet: feels like browsing on a very large screen. The primary use is for watching YouTube videos. YouTube has no Gear VR app yet but you can use Samsung Internet to watch 360 videos from YouTube. Jurassic World: puts you in a forest with an Apatosaurus. There’s no interaction but it looks great. Sketchfab: showroom of computer generated 360 images. Minecraft Gear VR: like being in the Minecraft world. Controller required. Gunjack Eve: like EVE: Valkyrie for Gear VR. In this game, you operate a gun turret. 1. Screendoor. On the S6, I can see the individual pixels which some people describe as like looking through a screendoor. It doesn’t bother me. 2. Cannot adjust focus separately per eye. 3. Cannot adjust interpupillary distance. 4. Fog up. A recurring issue for me. The lenses would tend to fog up. (The earlier, Innovator edition of the Gear VR has fans to reduce fogging.) To reduce fogging, I play with a fan in front of me. 5. Overheating. As you use the Gear VR, the phone gets very warm. You’ll get a warning about overheating. I haven’t played to the point of it shutting down from overheating but see below. 6. Occasional judder. Occasionally, there will be judder (the screen stutters instead of following my head movement). This happens with greater frequency as your phone heats up. 7. Nausea. If I use the Gear VR long enough, I get nauseated. How long it takes to feel nausea depends on what I’m watching. It’s almost as if I have a fixed amount of nausea endurance. As I’m watching, that endurance is depleted gradually. If the content is stable (e.g. the Netflix app), it uses up my endurance slowly. It seems that if the movement is linear and constant (e.g. BMW’s “Keep your eyes on Gigi”), it’s also not bad. But some content where the camera is flying around in a circle rapidly depleted my nausea endurance. I also felt almost immediately nauseated when the camera was handheld with no stabilization and the cameraman was walking. 8. Discomfort after extended wear. My face starts to hurt if I wear the Consumer version for let’s say 1.5 hours. I haven’t felt such discomfort with the Innovator Edition. 1. Controller. Some Gear VR apps, such as Minecraft, require a controller. I tried a Steelseries Stratus which felt good but unfortunately could not connect to my S6. I instead got a True Depth 3D BT Gamepad, a PS3-style controller that has worked well with my Samsung Galaxy S6 and Gear VR. 2. Using Gear VR as a Cardboard viewer. Yes you can use Gear VR for Cardboard apps and websites. See here. 3. Coldpack. To reduce overheating, some users have reported success with using a coldpack. See here. Others installed a fan on the cover of the Gear VR. See here. I haven’t tried either solution yet. I’ve only played in front of an electric fan. 4. Increase the FOV. Apparently, you can increase the field of view of the Gear VR by mounting the lenses on milk bottle caps. An additional benefit is that you’ll be able to adjust focus individually per eye. See here. I haven’t tried this yet either. 1. Google Cardboard – As I mentioned above, I don’t think they will ever be as good as Gear VR because it’s not optimized for VR. But if you’re looking for a good Cardboard viewer, I’ve heard good things about the Bobo Z4. One of my friends has it and he really likes it. 2. Google Daydream – Daydream VR headsets seem to be similar to the Gear VR and have their own electronics. I suspect it will feel similar. At the same time, because it’s open, I expect that it will have even more apps than the Gear VR. 3. Baofeng Mojing 5 – This is a mobile VR headset with built-in electronics. It one-ups Gear VR by adding 3D motion and gesture control with Leap Motion. Most importantly, it has positional tracking by using a pair of external sensors/beacons. It looks very interesting but I’m skeptical of the execution, and I have serious doubts about whether it will have adequate support from third parties (which means few apps). Gear VR is a solid VR system. It is truly capable of creating a convincing VR illusion that is far more impressive than what you can experience from Google Cardboard. 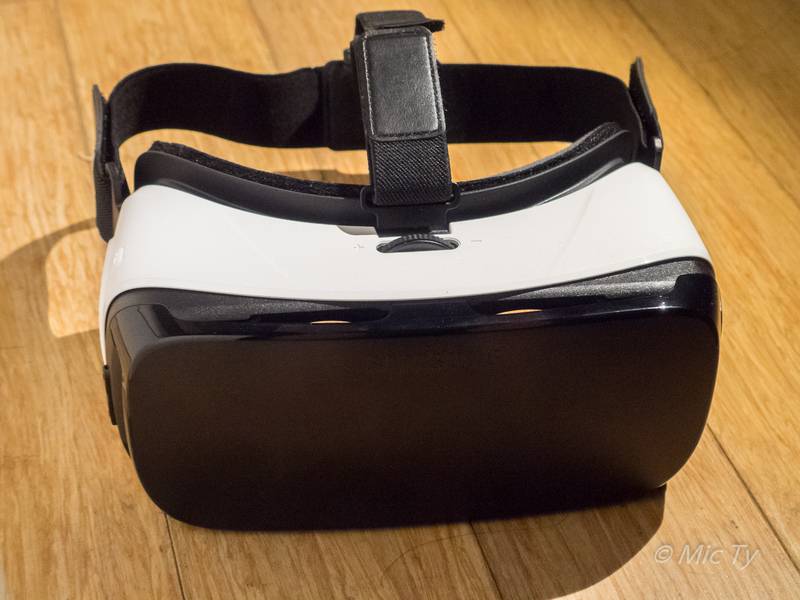 Watching through Gear VR feels more similar to Oculus Rift than the Google Cardboard. 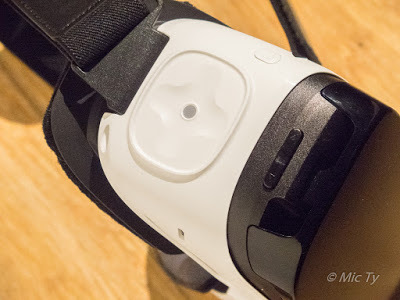 True, the Gear VR doesn’t have positional tracking but it is more affordable, accessible and portable. Most importantly, it is supported by many third parties and there is a growing number of apps. If you’d like to buy a Gear VR or True Depth 3D BT Gamepad, please consider buying one through the Amazon link below, which would be a great way to support this site without cost to you. 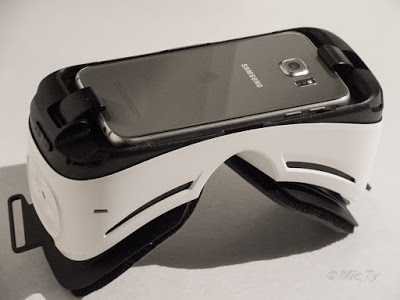 Using vr headset for samsung galaxy s5 is a amazing product to use. When I want to watch something I use them. A whole new virtual world with a lot of surprise. cannot use if if there is no wifi. i am using mobile data and i dont think there is any fix around it.